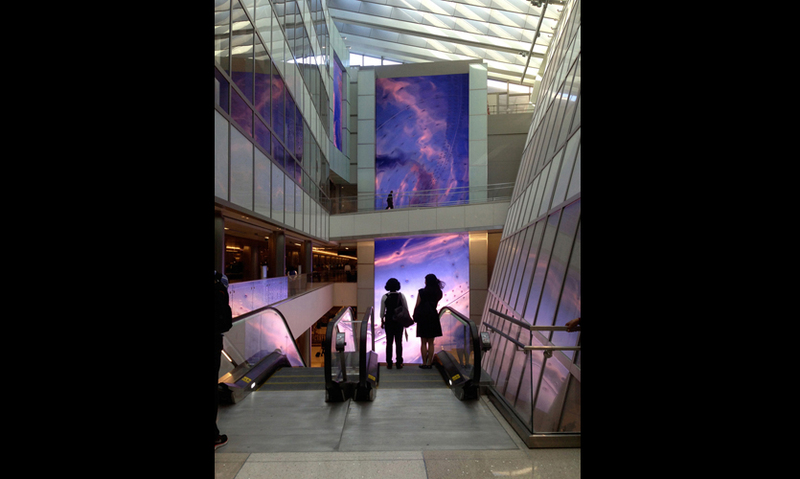 The epic digital landscape at LAX’s new Tom Bradley International Terminal took top honors in the 2014 SEGD Global Design Awards. The 2015 Awards are now open for entries! Set your sights on excellence by submitting your work! Art deco curtains part to reveal gold-toned dancers spinning inside a multi-tiered clock-like confection. Three-story-tall guitar strings quiver and plunk to the movements of passersby. A dapper 70-foot-tall gentleman tips his hat through a blizzard of slow-motion confetti. These aren’t scenes you would normally encounter in an airport, but then again, Tom Bradley International Terminal at LAX is not your typical airport. Phase one of a $1.9 billion upgrade to LAX’s international service opened in September 2013—a LEED Silver-certified building designed by Fentress Architects of Denver. 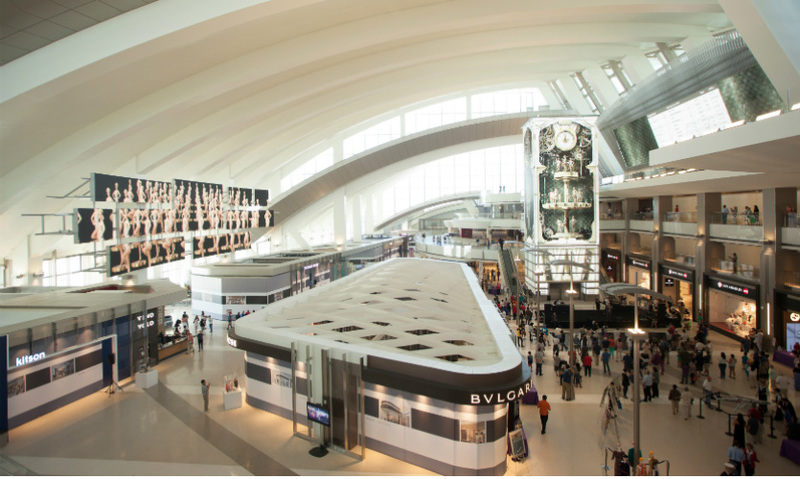 With the new terminal, Los Angeles World Airports (LAWA) also sought to elevate the passenger experience. 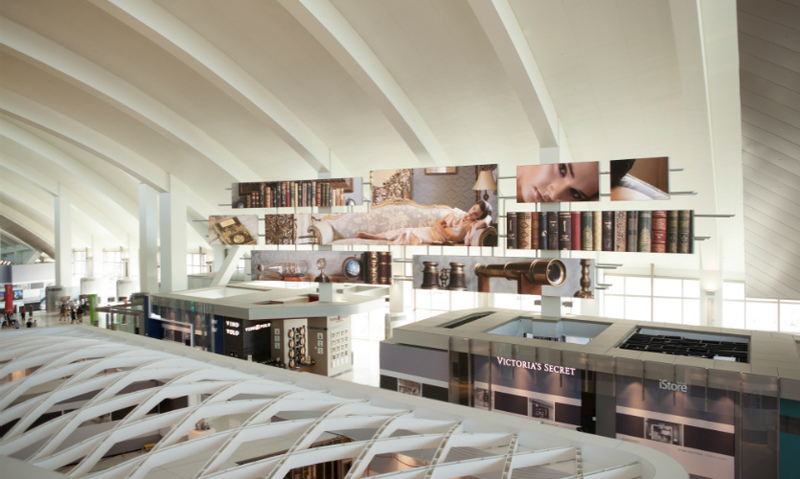 A $40 million, architecturally integrated media program does just that, tuning sophisticated content to the passenger journey through the terminal and reminding them of the excitement and adventure of travel. 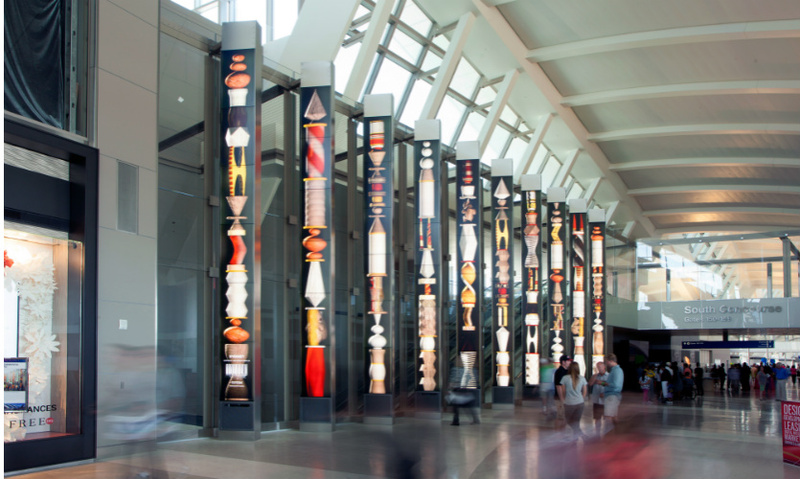 As the country’s largest international gateway to Asia, LAX TBIT welcomes more than 17 million international passengers a year. 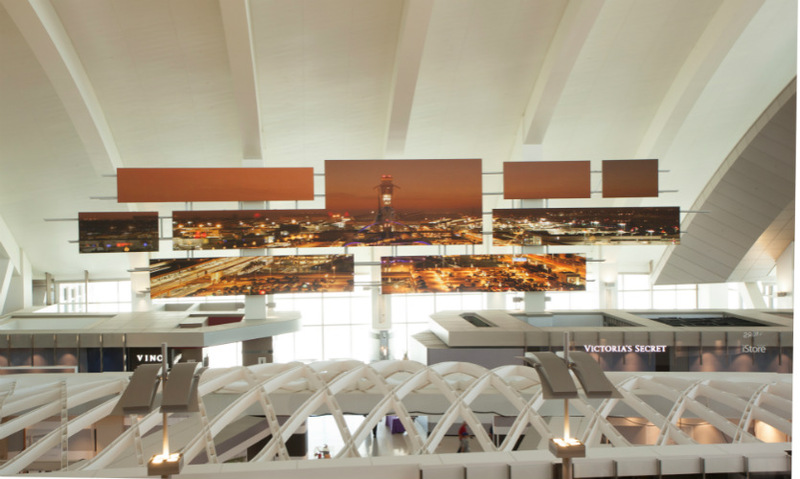 And at the new terminal, that welcome is now a literal one: after clearing immigration, in-bound passengers descend a two-story escalator to baggage claim that faces an 80-foot-tall by 26-foot-wide LED display. Breathtaking high-definition videos sweep the screen—from a slow-motion California shoreline bubbling toward the sand to a close-up of a metal aircraft carapace reflecting the setting sun. Interlaced with these videos are greetings to the arriving passengers in their native languages, uniquely timed to each arriving flight. That mesmerizing 45-second descent transforms into a colossal yet personal—and undeniably memorable—welcome to Los Angeles. 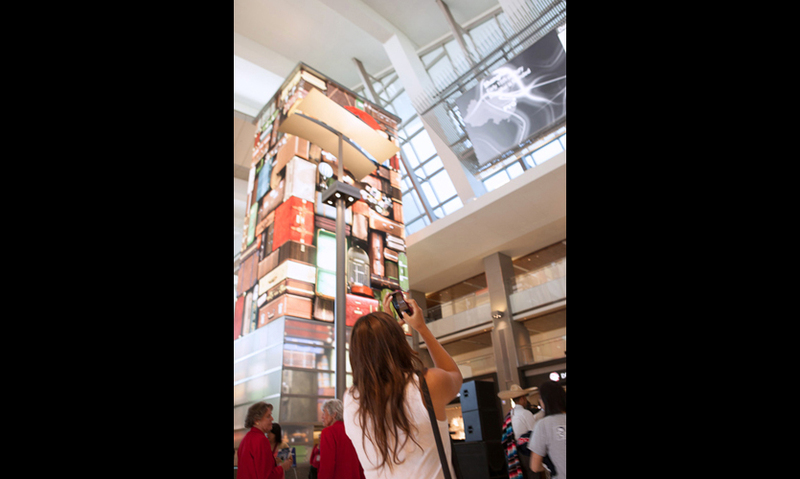 The Welcome Wall is just one of seven iconic and enormous digital experiences designed and produced by a multidisciplinary team for the new Tom Bradley terminal. The epic, cinematic landscapes are an ode to LA’s most celebrated industry. 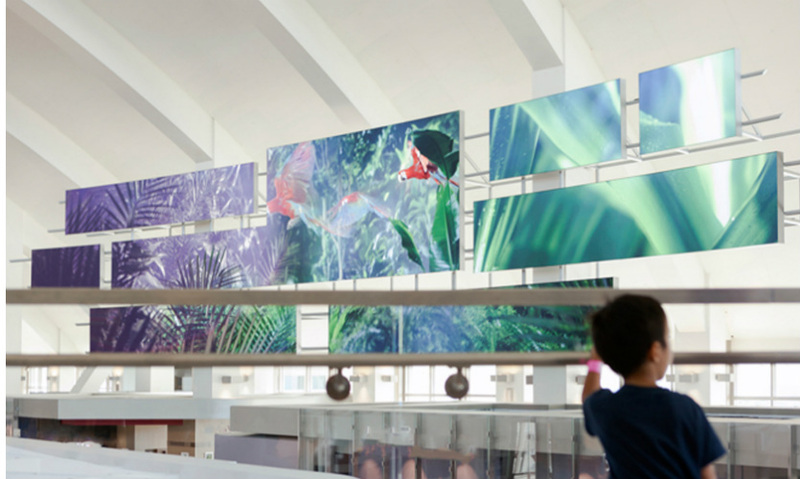 The project as a whole is called the Integrated Environmental Media System (IEMS) and is the largest digital media installation by far at any airport in the world. The statistics are stunning: 20 million LEDs over 12,000 square feet of displays, 105 million pixels or the equivalent of eight IMAX theaters. 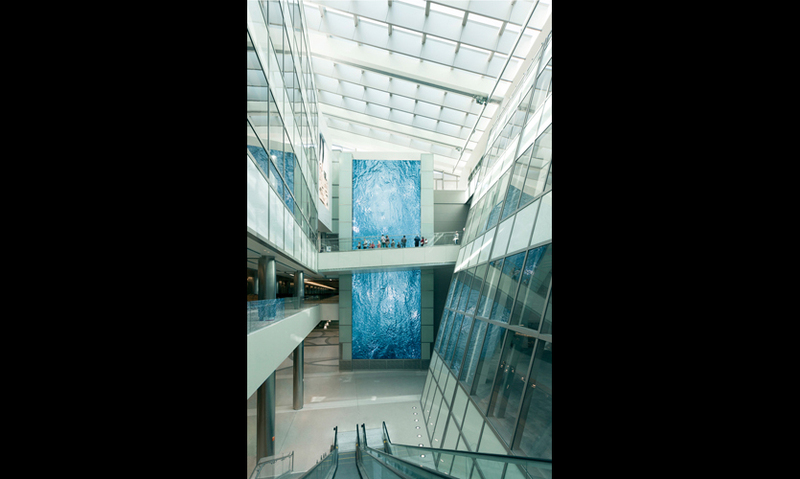 While the Welcome Wall delights arriving passengers, the other six digital monuments were designed to captivate departing passengers, who tend to arrive at the terminal two to four hours prior to their international flight. Their route to the gate is a linear sequence: from security to the Great Hall with its 110-foot ceilings and to either the North or South concourse. 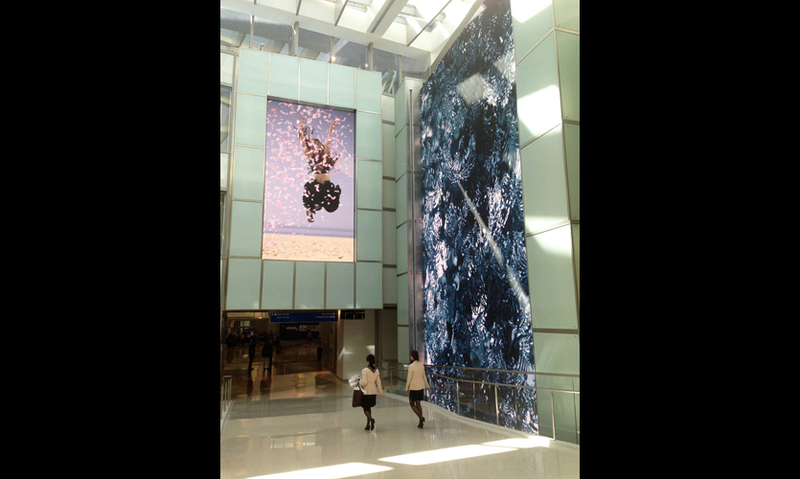 Perpendicular to the Welcome Wall is the Bon Voyage Wall, positioned to catch the eyes of outbound passengers as they collect themselves after security. At roughly one-third the height of the Welcome Wall, it is an ample digital canvas to broadcast larger-than-life Angelinos jumping and waving goodbye in super-slow motion. After encountering just two of the seven icons, a fundamental question comes to mind: Why would an airport spend $40 million to design and launch such a massive and technically ambitious array of digital spectacles? It all began with a series of conversations between Mike Doucette (LAWA’s chief of airport planning and project manager for the new terminal), public relations executive Michael Collins, and Mike Rubin, principal and founder of MRA International, a development consultancy specializing in destination and place branding. This was a new challenge for Rubin, an expert in building strategies for branded environments and entertainment complexes such as casinos and sports arenas. The fundamental question was, as Rubin remembers, “Could we think about media in a way that both supports the passenger experience and creates a revenue platform?” LAWA’s Board and its Executive Director, Gina Marie Lindsey, made it clear the two goals were nearly equal, but that the passenger experience must be the primary guide for the media program. 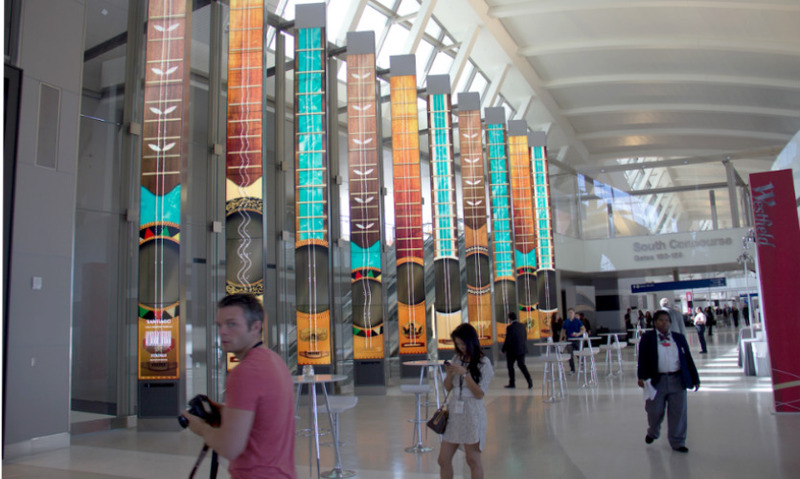 LAX had been relatively late in pursuing on-site advertising as a source of revenue, starting in 2006 with static and traditional digital displays positioned along the passengers’ journey. Airports derive most of their revenue from landing fees and leasing gates to airlines. But as the economy contracted and airlines staved off bankruptcy by slimming margins and squeezing expenses, airports’ aviation revenue fell and advertising became a priority. The new terminal was already under construction, but the opportunity to define a revenue-generating strategy while enhancing the visitor experience was too critical to ignore. So Rubin, Doucette, and architect Curtis Fentress brought Marcela Sardi, a designer of immersive experiences and a long-time collaborator with Rubin, into the project. Rubin’s role was to conceive the master plan for the entire media ecosystem. The team agreed on a guiding principle: for the outcome to be successful, the program had to be integral to the passenger experience and well integrated into the architecture. Sardi recalls the initial exploration: “We looked at the architecture—where could we feasibly integrate pieces? The placement had to make sense in terms of the flow of passengers through the space.” Rubin continued, “The [construction] train had already left the station,” but the executive team and architects agreed to incorporate the project within the existing construction schedule. While concept design proceeded, Rubin worked with a large LAWA team to develop a business case for the IEMS. The client team included LAWA Executive Director Gina Marie Lindsey (who originally envisioned the opportunity to differentiate the airport through a new form of media celebrating the city as a global creative capital), the LAWA Commercial Development Group led by Airport COO Steve Martin, Deputy Executive of Commercial Devleopment Debbie Bower, PR representative Michael Collins, and LAWA’s Board of Airport Commissioners. Rubin emphasized the importance of this effort early on: “Design is not just a physical expression. It’s an overall strategy that must address the sustainability of the experience and its evolution,” and in most cases, he adds, that means generating revenue to sustain it. After a series of collaborative meetings with Mike Doucette and Fentress Architects, the definition and location of each of the seven features was complete. Mike Rubin headed the content strategy for the program while Marcela Sardi developed the materials palette and design intent of each feature as mindful extensions of the Great Hall’s interior design. The most spectacular of the landmarks is the Time Tower, a modern interpretation of the station clock that set the pulse of the great train stations of the world. Rising 72 feet high in the Great Hall like a clock tower in a village piazza, the Time Tower was conceived as a four-sided mediascape clad around an existing elevator core. 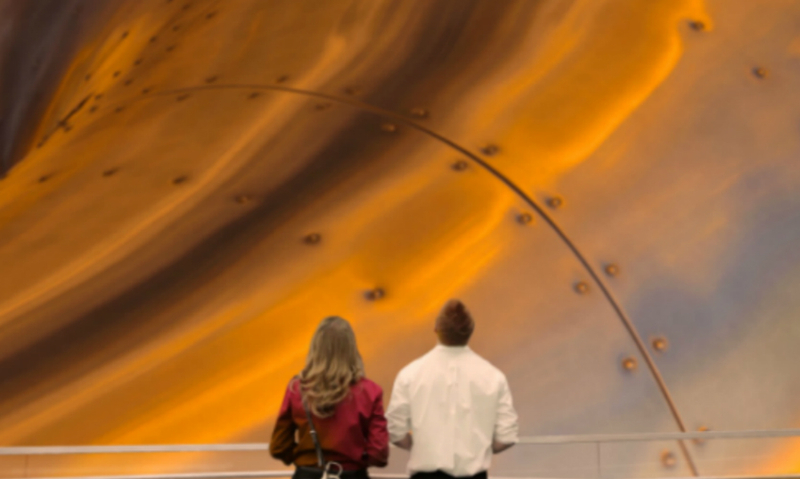 Floating above the west expanse of the Great Hall’s curved ceiling is a 120-foot mosaic of screens inspired by the storyboard, the creative industries’ tool to visually express a narrative in a series of frames. The composition of eight screens is well suited to telling stories of Los Angeles interspersed with tales of travel to far-flung destinations like Brazil and Thailand. Passengers glimpse the Story Board from numerous angles—over a storefront roofline, from the second-floor lounges, and as they head to the concourses. Across from the Story Board and adjacent to the Time Tower is the Destination Board, a 75-foot-wide digital display set against an aluminum brise-soleil. Real-time flight data spawns clouds of related information, such as local weather conditions. Accentuating the transition from the Great Hall to the North and South concourses, a series of 10 slender, 28-foot tall pylons composed of LCD screens flank the travelers’ path. Equipped with motion sensors, these portals display global artistic traditions and are subtly animated by the movement of passersby. While structural, engineering, and lighting modifications for the landmarks were made as a series of change orders to the architectural plans, Moment Factory, a multimedia design and production studio headquartered in Montreal, transformed the content strategy into immersive, ambient media. With one year left before the terminal’s opening, Senior Multimedia Director Melissa Weigel explains, “Our mandate was not only to produce the media itself, but to produce the content guidelines to help future creators develop for the system.” Moment Factory’s team of 60 full-time motion designers, filmmakers, and animators joined forces with an army of freelancers to create not just the media for individual elements, but to design what Weigel calls an “orchestrated media environment…with a common cinematic language.” That language has aspects of travel documentary, fantastical set pieces, and ethereal imagery, all conveying the romance of travel and the delights of Los Angeles. Moment Factory created 40 short-films, each tuned to the exact technical requirements and dimensions of its media landmark. For a Time Tower short inspired by silent comedy actor/producer Harold Lloyd, the team built a full-scale model and shot live-action footage. The resulting film transforms the Time Tower into a Beaux-Arts apartment building with characters teetering on the window ledges and hanging from the clock’s hour hand. Creative and environmental design agency Digital Kitchen came on board to design and deliver a collection of “ambient narratives”—documentary-style stories that captured the spirit of Los Angeles and portraits of destinations like Seoul and Barcelona. Their hypnotic cinematography washes across the Story Board and down the Welcome Wall. 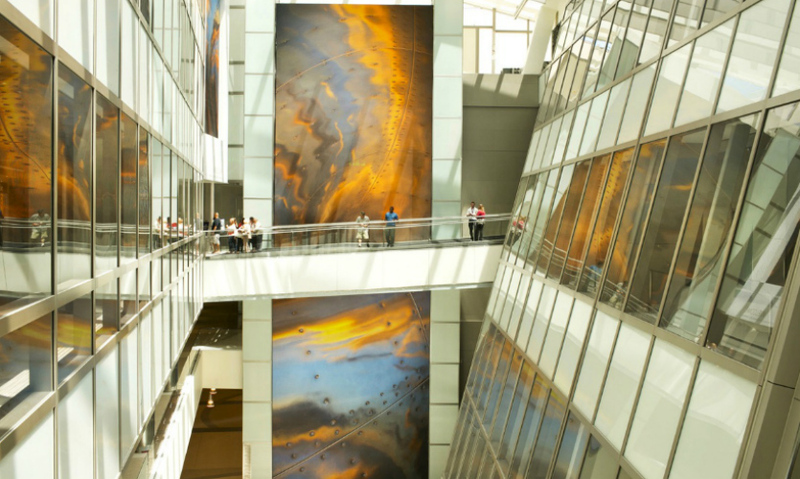 In addition, DK Digital Kitchen was charged with developing brand expressions for LAX from the poetic slow- motion aviation skins with HDR’s to sculptural cloud layers that float across the features. According to Marcela Sardi, “Media is another layer of architecture.” The team sought ways to integrate the digital media components within the architecture, but a more novel approach was to integrate architectural elements into the media itself. For example, the Time Tower base features raised horizontal bands or string courses made of aluminum. Several of the animations that play on the Time Tower use a digital version of the string courses as a framing device. Because they are animated, the digital aluminum struts can move and rotate to form fantastical structures. In effect, the architecture comes alive, daring viewers to puzzle out what is real and what is not. The complexity of building, installing, and deploying the media ecosystem cannot be understated. Moment Factory and Digital Kitchen produced about five hours of HD and large-format content, some of which process real-time flight information to render customized experiences timed with flight arrivals and departures. Moment Factory’s X-Agora video servers render the interactive content and generative content. Smart Monkeys (Miami) designed the sophisticated playback and show control system—the platform that runs all the media features. The system is a fusion of broadcast, A/V, digital signage, and enterprise-level networking to support the speed, data, and performance benchmarks the project required. LA-based Electrosonic Inc. integrated the entire system and built its NASA-like control room. Of the $40 million spent on design, development, and deployment of the IEMS, roughly $20 million was spent on the display technology, $6 million on the content, and the rest on fabrication, engineering, and consulting. To inaugurate the system and enable the sponsorship platform, the airport authority sought bids for a Terminal Media Operator or TMO. Rubin and LAWA’s Commercial Development Group Doucette defined the TMO as a unique collection of responsibilities: to manage the sponsorship guidelines, to solicit sponsorship opportunities for the seven media landmarks, to manage those agreements after they have been approved by the airport authority, and to maintain the media infrastructure itself, which is estimated at roughly $2 to $4 million a year. The sponsorship guidelines drafted by Rubin and LAWA are intended to protect and evolve the high caliber of the content designed by Sardi, Moment Factory, and Digital Kitchen. Sponsors are allowed a maximum of 12 minutes per hour in aggregate (equivalent to 20% of the time) to communicate their brand on the media feature. Sponsors are also required to provide passenger benefits such as apps, charging stations, or other amenities to make the travel experience more enjoyable. Leslie Wolke ([email protected]) is a wayfinding technology consultant. She is a past member of the SEGD Board of Directors and founding co-chair of SEGD’s annual design+technology event, Xlab. Systems Engineering and Integration: Electrosonic Inc.
For more award-winning projects, visit the SEGD Global Design Awards archive. 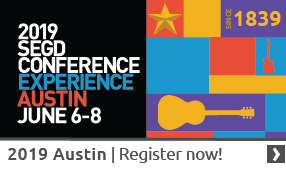 Enter your work in the 2015 SEGD Global Design Awards! For even more content in your areas of interest, see SEGD's Xplore Experiential Graphic Design index.